Up to a quarter of people attending university now live at home and some institutions now have over half their student population living away from campus. Despite this, universities often focus entirely on attracting and supporting campus students. According to an article in the Guardian Newspaper in January 2018, 'Commuter students, living with their families, are not having an easy time in a system geared to the residential experience. They are locked out of lectures or reprimanded by staff for being late when public transport lets them down. They are excluded from freshers'/commencement week functions ticketed in student accommodation and, if they do go on a night out, they are constantly checking their phones for the last train'. Recruiting this demographic requires more than strong marketing campaigns but a focused strategy to improve their student experience. Supporting commuter students with better digital options could help institutions increase their intake of this growing demographic, who are living at home to manage the costs of attending University. Let's explore some of the challenges facing commuter students, the opportunities to better support them through digital technology and what to highlight in student recruitment campaigns. 1. Commuter students can find it harder to make social connections and to feel part of the student community. Universities can build a commuter community supported by induction events and virtual meetups. 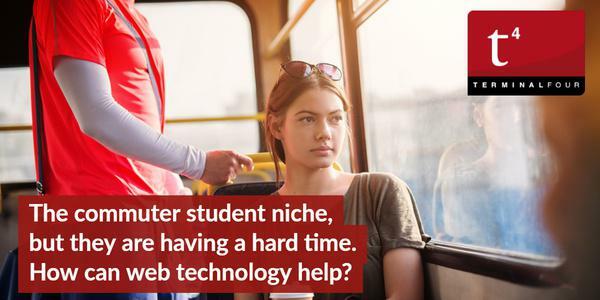 Digital channels can provide opportunities for commuter students to connect before they attend university and once they commence their course. WhatsApp and Facebook groups can be used to encourage interaction and to facilitate physical and virtual meet-ups. Institutions can identify commuter students early in the recruitment process with online data capture, at open days and campus visits, and other events, and provide opportunities to connect with other commuters. 2. Finding study and meeting areas with charging points for laptops and mobile phones. Enable students to log in and book vacant rooms or study areas on the fly. Take a walk around campus at Bath Spa University, and you'll see room booking software on tablet devices attached to the walls. These show the upcoming meetings booked for each room, but they also enable students to log in and reserve vacant slots so they can use rooms when they are available for charging their laptops, phones and getting some work done. Rarely do prospectus/viewbook and other campaign materials specifically outline the environment and technology provisions made for commuter students but with more people living away from campus now could be the time to create focused communications for this group. Email campaigns to identified commuter students can further enhance the reach of these messages. 3. Timetables are not always accessible and are subject to change. Implement online timetabling with push notifications for timetable changes and make it accessible from any device to help commuter students react to cancellations and to plan their days effectively. If lectures need to be canceled, rescheduled or moved to a new location, it is imperative that the message is communicated early and using digital push notifications. An email or a piece of paper stuck to a door is no longer good enough for students who have traveled to attend a lecture. 4. Parking on campus can be unpredictable and frustrating. Help students to locate and pay for parking on campus with parking apps. Honk, for example, now provides parking services at over 20 campuses across Canada. It allows students and staff to search, pay for, and top up parking directly from their smartphone, tablet or computer. Parking, or the lack of parking, is one of the largest areas of dissatisfaction for students. Many universities and colleges even see the problem taking over their social media channels at certain times of the year, taking away from your core message and perhaps damaging your brand. Universities like the University of Sunderland are now proving first-year students with a free travel pass, that can be used at any time not just traveling to the University. 5. Commuter students don't often feel their needs are well catered for. Dedicate an area of the university website to commuter resources. New York University and the Illinois Institute of Technology, for example, both include information for commuters, covering which programmes are suitable, transport information, faqs, and further resources. Wright State University offers an entire commuter handbook online. These initiatives are helping them to connect with commuter students and enhance their recruitment activities. 6. Commuter students can find it more challenging to attend lectures where timetabling conflicts with transport times. Livestream lectures and provide access to lecture video content and virtual learning environments to help make sure commuter students don't miss out when they can't get to the lecture theatre due to transport disruption. Deakin University has developed a personalized learning approach, with students able to access a vast array of online material and the opportunity to book virtual meetings with supportive supervisors using Skype or Facebook. The institution also offers DeakinSync, which enables students to stream lectures and presentations, chat with classmates, submit assessments, and set up a personal portfolio. Measures which tailor the physical campus to commuter needs tend to be costly - from installing lockers with power outlets to increasing parking provision to opening up accommodation services for short term stays and creating commuter specific buildings. However, with the number of commuter students set to grow, most universities will increasingly require a strategic plan and investment programme to support commuter students. By focusing on improving the student experience for this growing demographic, there is a real opportunity not to be missed. Technology can make a difference in helping to ensure that commuter students feel a sense of community and get the most out of their studies on an equal footing with on-campus students. This laser focus has helped colleges such as Bunker Hill Community College. They focused on students that work during the day by offering midnight classes that finish at 2.30am, and it has been an enormous success. Now is the time to take a strategic approach to commuter support, and packaging this into marketing which resonates with commuter students. What measures has your institution taken to support commuter students in its digital strategy? We'd love to know.